Seasons and climate change are intimately linked. Seasons hadn’t existed on Earth for millions of years, not since the radical seasons of the Snowball Earth. The Snowball Earth was a time well before the CALM when the moon was initially retreating and the earth was tilted 54 degrees. Following the calamity of the Snowball Earth event, the earth’s axis had been slowly approaching a vertical stance as the moon moved closer. There is a direct correlation between the distance of the moon and the tilt of the earth’s axis. The closer the moon, the more vertical the axis, whereas the further away the moon, the more tilting and wandering of the earth’s axis. After the close approach, and the ensuing chaos that took place, the moon began to retreat. The slowly retreating moon allowed the earth’s axis to begin to tilt and seasonality began again during the Cretaceous. The introduction of seasons were about to bring big changes for Earth. But at first these changes were tempered because of rising sea levels. During the initial stages of seasonality, the seasons were weak and easily hidden by the higher sea levels. These changes were initially tempered by the great expanse of ocean which made for a relatively temperate marine climate throughout the Cretaceous world. The Cretaceous is known for very high sea levels with most of the low continental shelves flooded. What drove the oceans out of the ocean basins and onto the continental shelves was the growth of the mid ocean ridge system. As tectonic activity, due to tidal heating accelerated, the mid ocean ridges grew and displaced water. Plate motion, fueled by tidal heating of a closer moon, caused the emergence of the mid ocean ridges as the continents spread. These rising underwater mountain chains, which grew down the center of the ocean basins, displaced large volumes of sea-water. The displaced water then rose and submerged low coastal continental shelves. The encroaching seas covered more than a third of the continental land surfaces, resulting in the flooding of all the low lying continental shelves, including the Great Plains of North America. Sea levels reached their peak during the mid-Cretaceous. At the Cretaceous-Tertiary Boundary the seas began to fall to their modern levels. The tectonic system was again slowing, as the moon retreated and the axis was tilting. Slackening tidal heating reduced the size of the mid ocean ridges and the oceans retreated into their historical basins. The lower sea levels revealed larger areas of land. As the landmasses grew, more interior area was exposed. Whereas before the large oceans were moderating the initial signs of seasonality, now the shrinking oceans and tilt-driven seasonality finally began to have a significant influence on climate change and ultimately life. 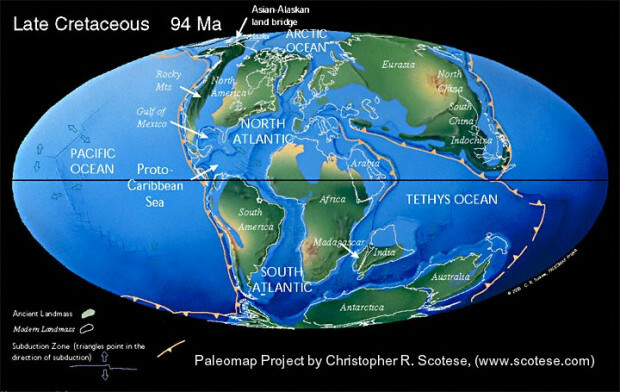 The transition between the Cretaceous and the Tertiary is the time when seasonality begins to drive evolution on Earth. Exacerbating the increasing seasonality was the fact that new continents were moving into more polar latitudes. Climate changed and temperatures fluctuated more drastically during this volatile time. Ultimately the introduction of new landmasses into the earth’s polar regions provided platforms for the accumulation of modern continental ice sheets. This would eventually play an important role in modern global sea levels. Once these radical changes began occurring at the end of the Cretaceous, the animals most ready to adapt became the ones to survive. Birds had developed feathers for mating rituals but found them more useful for shelter in the slowly evolving colder climates. Feathers allowed birds to adapt with the cooling seasons by allowing for insulation from the cold and combined with the ability for flight, allowing for migration. Mammals also were prepared for a cooling trend in the earth’s environments. Fur like feathers allowed for thermal protection and opened new territory for species diversification. In addition, angiosperms rapidly evolved to fill the void left by plants unable to thrive under this new seasonal regime. Seasonality was a major contributor to the demise of the dinosaurs, the rise of mammals, and our climate debate today.